Pasha Dental incorporates an engaging interface with some of the most modern website design technologies to immediately grab the viewers interest and establish authority and trust in a single glance. Located in Brooklyn, NY Pasha Dental needed to stand out among its competition to be effective, the combination of colors, bleeding edge imagery, and smooth design helped it do that. Video-based advertising has been proven to be incredibly effective since the advent of the TV commercial, and it didn’t take long for it to find its place on the Internet. The Pasha Dental site uses this imagery to its best advantage, and then presents the services and expertise available at the clinic in an attractive and fluid layout. The Pasha Dental site uses a set of muted but complimentary colors to present information and present its location in a striking yet subtle manner. • Contrast – Grey, white, and pink may seem an unusual palette on the surface, but these three colors come together to present a beautifully composed and muted color scheme that allows images and video used throughout the site to take center stage. • Setting The Mood – These three colors are known to have a calming effect on the viewer, aiding those who may experience dental anxiety or are looking for a soothing visit. The white aspect of the palette, along with the gray, is known to elicit a sense of professionalism and cleanliness. • Space – For all the information it makes available the Pasha Dental sites design ensures that the site doesn’t seem cramped or messy. The opening video and the footer take center stage once you reach them, leaving you with a relaxed sense of openness. • Imagery – The imagery throughout the site is used to send information to the user and make the information they’re looking for easy to find. As mentioned previously both the first video and that in the footer help to establish a sense of location so important when trying to draw in the locals. • Navigation – Navigation on this site couldn’t be easier, with everything presented in large, easy to find cards throughout the home page. Bright and friendly lettering ensures that the different sections of the site are easy to locate while scrolling and the menu located at the very top of the page makes navigating directly to where you want to go a breeze. • About Us – The About Us sections highlight the qualifications of each of the dentists as well as their personal missions statements, while the “Our Office” section of the About Us speaks about their staff, their facility, and what a visitor can expect from their team. • Contact Information – One of the challenges of web design is ensuring that you make your contact information easy to find without having it assaulting the viewer at every turn. This site uses an understated approach to provide all the necessary contact information in the footer while making the contact option from the top menu immediately visible and accessible. Availability without pressure is the key to this design. • Informational Footer – This video footer helps to establish authenticity for the company by showing one of its areas most iconic pieces of imagery, the Brooklyn Bridge. It uses this peaceful imagery to capture the eye and present contact information effectively. 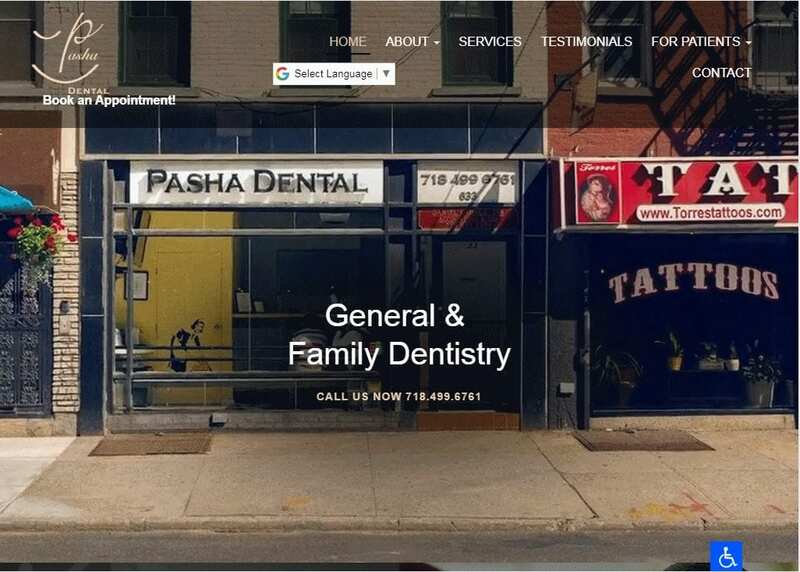 The Pasha Dental Website was clearly meant to serve its local community, and it relies heavily on that sense of locality to drive conversion. The video serves double-duty here, establishing a sense of ease in the viewer by presenting friendly staff and a clean facility, as well as highlighting its location within the city. The overall design also makes navigation and finding information easy for the viewer, which is vital in keeping the user engaged and encouraging them to make an appointment and continuing to use this location. This site reflects a local business looking to connect with its community while providing efficient and friendly service. The use of video elements also speaks to an office that wants to be seen as progressive and staying abreast of the most recent technologies to provide the best service possible to its clientele. Their clear focus and investment on their local community is evident throughout their choices of imagery and is one more thing driving conversion in their viewers.